The Ongoing Adventures of the Juma Gang, Session #44: Victory! Here’s what happened in last night’s game, notable by the absence of Juma Ji’ad’s infamous dwarf wall of fire and any magic missiles from Gil. We also tried out the Escalation Die from 13th Age with, I think, generally positive results. Each PC gets 1,540 xp. The PCs haven’t had long to catch their breath before the road is torn apart as thick vines burst from the ground! Blightborn thorn blights and a tree-like demonthorn are attacking, sprouting up where the troglodyte scattered his black seeds. The Juma Gang are on form, though, and criticals from Sora and Ulthar make short work of the demonthorn while the others deal with the humanoid thorn blights. More of the diseased plant creatures appear each round – the party aren’t’ sure if the demonthorn that turns up is the same one reborn or a different one entirely. A pair of thorn blights take down the wounded Captain Mannarin, but loyal Private Pike hurries to his side and stabilises his wounds, just before Ulthar was going to give up on the captain as a lost cause. Juma slays the second demonthorn and the genasi’s companions dispose of the remaining blights. As the plant monsters fall, the trees and shrubs in this part of town shrivel and die. The raid on the town is over and the last of the troll army has been driven back. Bax and Simlathril come running, flinging their arms around Sora and Gil respectively, relieved that their loved ones have survived the battle. While most of the PCs head off to the Cloudwatch Inn to celebrate, Juma Ji’ad goes to the temple to have his mutation dealt with. The homely priestess of Thellyne, Leda, performs a remove affliction ritual, assisted by Rillard, novice of Darmon, who holds the genasi’s hand throughout the ordeal. Juma is cured of his condition, but not without suffering a great deal of pain (104 hp lost!). Unsurprisingly, Leda isn’t keen on making a donation to the Juma fund afterwards. Rillard escorts the genasi to the pub, tells him to avoid any strong liquor, and runs off before he is groped. Gil spends the night with Simlathril; Bax holds Sora’s hand and gives her a chaste peck on the cheek at the end of the evening. 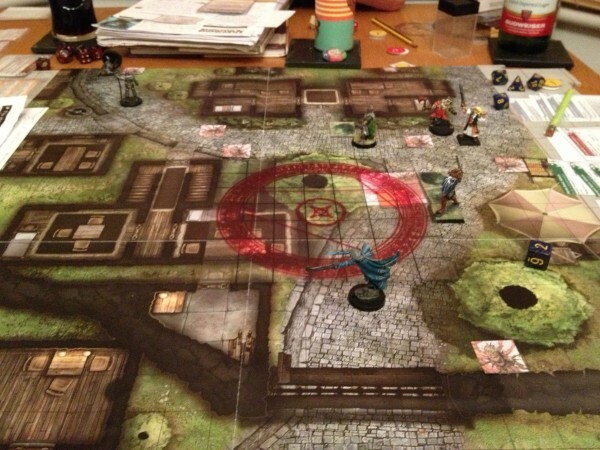 The Juma Gang are summoned to the town council in the keep. Mayor Kelana Dhoram, the eladrin captain Rennisar (Simlathril’s older brother), Captain Mannarin and the eladrin emissary and sage Rualiss are all present. The PCs are thanked for their efforts in saving the town and presented with a suit of +3 darkleaf leather armour as a reward. Rualiss explains that he thinks Skalmad’s magic eye was actually Moran’s Eye, an item that allows the wearer to return from the dead. The sage offers the PCs the chance to help him research the matter in his library. Sora, Gil and Juma go there and learn of a fomorian artifact called the Stone Cauldron that is mentioned in legends about Moran’s Eye. Gil also casts sending to find out if Forathin is still being plagued by corrupt fey, and if his father is still happy to give his armour to Juma. Yes and a reluctant yes are the answers. The PCs return to Rualiss’ island to do more research but don’t learn much more – they do find out that the disappearance of Skalmad’s body is not solely a property of the Eye. Giving up, they leave further investigations to the eladrin sage. Rualiss explains that the Stone Cauldron is not a relic, but a magical site. It stands within a ruined fortress in the Feywild, just east of the Feywild equivalent of the Trollhaunt, suggesting Skalmad has a way to cross over into the Feywild in or close to the Great Warren. Since the troll king is almost certainly not dead, the mayor is keen that the PCs return to the Great Warren to deal with him. Hrothgar asks for a further reward and Kelana reluctantly offers 2,500 gp, the contents of the town’s treasury. Some awkward haggling follows but eventually the mayor agrees to give the PCs farmland instead. After travelling through the now familiar marshy bogs of the Trollhaunt, the PCs arrive at the entrance to the Great Warren. As Hrothgar and Juma sneak inside via the stream, Ulthar tries to intimidate the warren troll guard to let him in. When this doesn’t work, Gil casts incendiary detonation through the hatch in the doors, knocking the troll for six. The ettin in charge of the guard post opens the doors and smashes his club into the wizard, and battle is joined! The PCs are facing the ettin, two warren trolls and two nothics – used to handling such opponents, they make short work of them, using fire magic to make sure the trolls stay down. I love that map. Where did you get it? It comes with the adventure - P1 King of the Trollhaunt Warrens.